"Part of the authoritative four-volume reference that spans the entire field of child development and has set the standard against which all other scholarly references are compared. 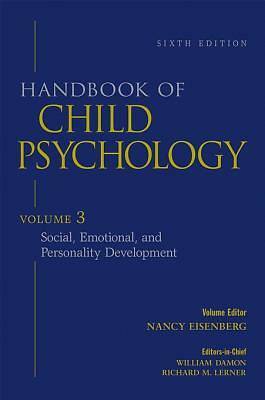 Updated and revised to reflect the new developments in the field, the Handbook of Child Psychology, Sixth Edition contains new chapters on such topics as spirituality, social understanding, and non-verbal communication. Volume 3: Social, Emotional, and Personality Development, edited by Nancy Eisenberg, Arizona State University, covers mechanisms of socialization and personality development, including parent/child relationships, peer relationships, emotional development, gender role acquisition, pro-social and anti-social development, motivation, achievement, social cognition, and moral reasoning, plus a new chapter on adolescent development. "